Here’s the second edition of what I hope will become a regular feature here on Broken Hearted Toy - - a celebration of independent rock publications from the past. Based in Evanston, Illinois, Matter debuted in 1983, with editor and publisher Elizabeth Phillip at the helm. If I remember correctly, she originally intended it to be an R.E.M. fanzine, but quickly expanded its coverage to other bands. 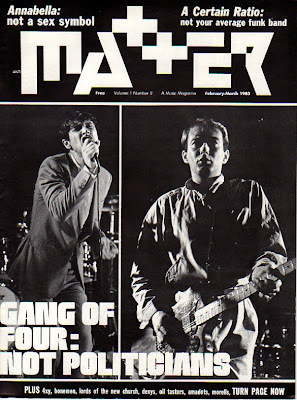 This February-March issue (Volume 1, Number 2) offered features on Gang Of Four, A Certain Ratio, Lords Of The New Church, and Dexy’s Midnight Runners. Some of the artists whose LPs were reviewed included Chris Stamey, John Cale, and Rank & File. Phillip also reprinted a letter that scenester Nancy Rapchak had sent to then President of NBC Entertainment Brandon Tartikoff ridiculing the portrayal of punk rockers on TV shows like CHIPS and Quincy. Matter had a cool B&W format with a lot of photos, as well as ads from the Wax Trax and Gramaphone LTD. record stores, and the 950 Lucky Number and Exit rock clubs. 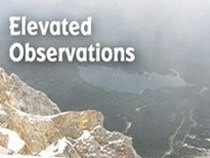 It was a perfect barometer of its time, and remains a favorite in my collection.